Yes, you can get scans all over the internet for as low as .22 cents and many range from .39 cents to .64 cents each, but these are high-volume (only of mounted slides) and files sizes are typically only 7.3 mb to maybe as high as 18mb…and I had to ship them my negs and slides. None of these cheap options will be high quality; they will not clean my film like I would and they will not dismount my slides to copy them Flat and Full Frame including film edges so that I can print them full frame. You see I was taught forty-years ago that with 35mm you needed to "fill the Frame", when using this tiny format, for the best quality and I did this well! 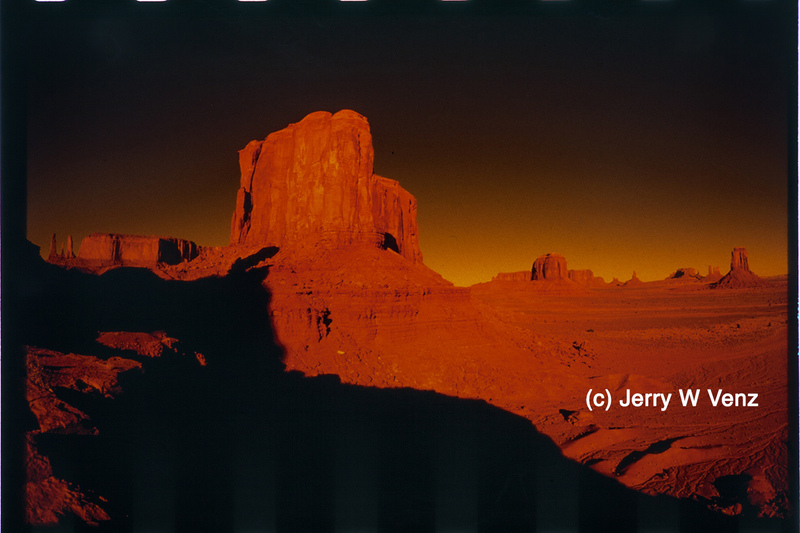 So, having done a lot of print copy work, for my wife's photo-restoration work, I felt confident that my Canon 5D MKII would produce nice printable files of my favorite slides and negatives. I just needed a good Macro Lens that could do l:l copy work--which I currently don't own. On one of our calls with my son Alex, he reminded me to check out BorrowLenses.com to RENT what I needed for this first pass of digitizing my old slides, before buying one of these Macro Lenses. I ended-up renting the Canon 100mm f2.8 Macro lens for 7-days at a cost of $64.28 with tax and shipping both ways (they had a small special going). I figured this was going to save me a lot of money over having a digital lab do hi-res scans of my selected 50-favorite slides/negatives. But, I digress, if you want truly high quality digital copies that require the least amount of Photoshop clean-up from your film, preparation is everything--and that starts with cleaning the film. 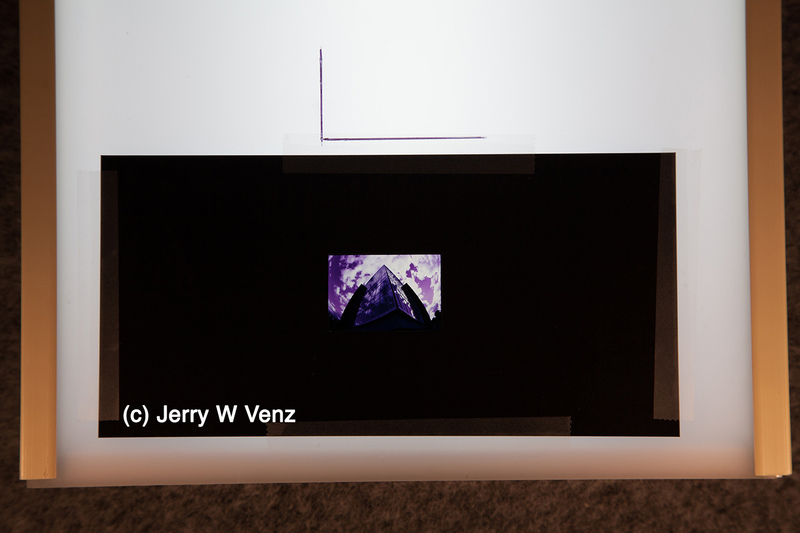 1) You'll need the X-Acto Knife to split apart the paper slide mounts. Be careful not to crease your slides when pealing them off the mounts. 2) Use the highest percentage Isopropyl Alcohol you can find -- 90% or more -- to clean your slides and negatives. I found that using 70% alcohol there was residue left on the film after it evaporated. 3) Use Q-Tips dipped in the alcohol to clean your film and evaporate the alcohol under the hi-intensity lamp; follow-up with the canned air. 4) Tape your unmounted slides to your light box with Removable tape; it's easy to remove--it won't damage your film and leaves no residue. 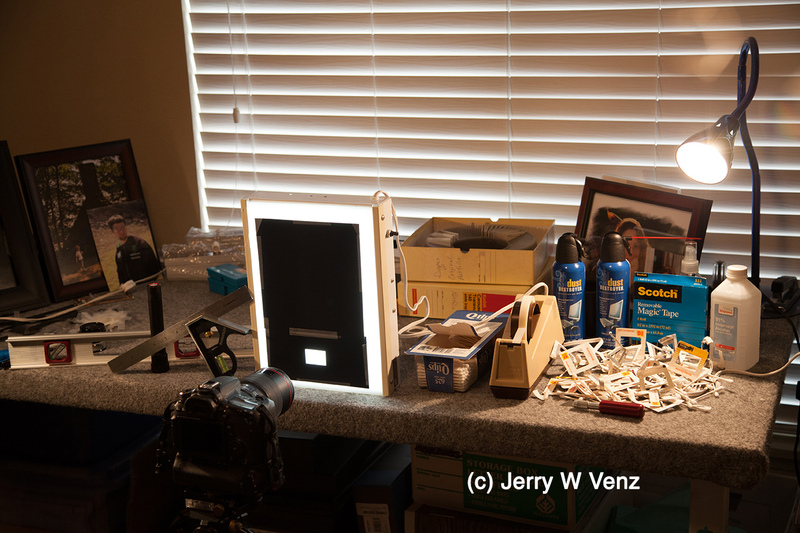 5) Use the flashlight and skim across the film you just mounted to the light box to make sure you don't have any dust. If you see dust, just give it a quick blast of air to remove. 1) If you want to get the largest Megapixel file of each slide you need to fill-the-frame with each image captured. To do that you must match the aspect ratio of your camera to what you are copying. ie., 35mm file is 24mm x 36mm and Full Frame DSLRs are the same. 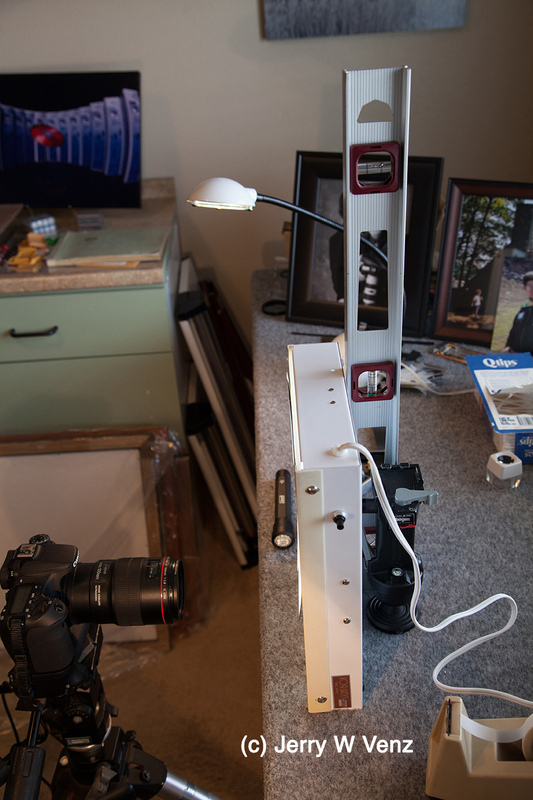 3) You'll be doing time exposures here so you'll need the tripod and a wired remote release. 4) You need the carpenter's square and level to make sure everything is squared-up and level. 5) The 3-way pan head will allow you to level the camera on it's X and Y axis. Once you have leveled your tripod head, it is vital that you then make certain the light box and camera's film plane are CO-PLANAR. They must be PARALLEL with each other so you will get a non-skewed image of each slide. If you're not coplanar you'll be creating parallelograms or keystone images that will not fill the frame of your camera. After you get your distance set to get a full frame image, with the slide in focus, you must check that everything square. 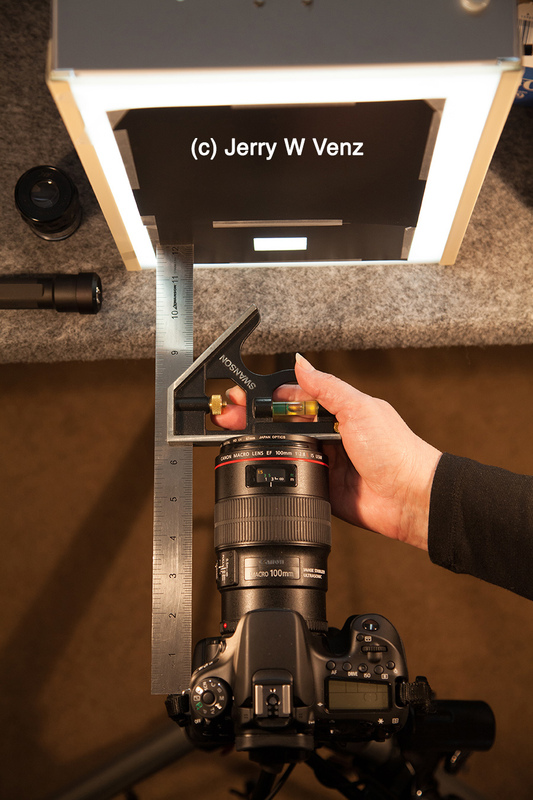 Since thee are no flat surfaces on most DSLR's except for the front of the lens, you merely place the level across the filter on your lens and slide the rule to the light box until it just touches the surface. If you see an uneven gap, twist the light box to remove said gap. In addition to being square, you also want the light box to be vertical. You can simply check that with a carpenter's level on the back surface of your light box. I placed my Bogen Tripod grip head, on my table, behind the light box, to apply pressure against the back of the light box to keep it vertical. I did everything in RAW mode, manual exposure at 100 ISO.The f-stops I used were f8.0 or f11.0 and the exposures varied from 1/2 second to 1.5 seconds depending on the film's density. I would not suggest a wider aperture than f8.0 since I was only getting 1/8" depth of field with the camera and lens set-up 12 inches from my light box. THAT'S ALL THERE IS TO IT! It was a lot of work, but I did save a bunch of money and my precious art slides stayed in my possession for the whole process.